St. D'vencE 100% Pure and Organic Neem Oil is an effective solution to restore damaged skin and hair. It is extremely beneficial to those who suffer from various skin conditions like acne, eczema, psoriasis and so on. It is loaded with Vitamin E, antioxidants and fatty acids that promotes hair growth and strengthens hair from the root, making it smooth and lustrous. You can use it to moisturize your skin and get rid of dry itchy skin woes. 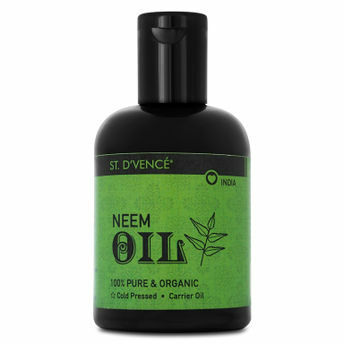 Serving well as a skin conditioner and toner, the oil has multiple benefits and can be used as a massage oil, aromatherapy oil or carrier oil. It blends seamlessly with essential oils or any mix-ins. Rich in ethically sourced ingredients which are a major source of essential Vitamins and Minerals, that aid several skin problems like rashes, allergy and irritation. It works wonders as an insect repellent too.